Following the revelation that Special Counsel Robert Mueller unearthed no evidence that President Trump or his campaign colluded with Russia to sway the 2016 election, Trump allies are now awaiting the results of two long-running internal probes that could expose the backstory behind the Russia probe's beginnings -- and provide more detail on already-documented misconduct among top FBI and DOJ officials. DOJ Inspector General (IG) Michael Horowitz confirmed at a panel discussion last week that his office is continuing to review potential surveillance abuses by the FBI, a review that began last March and that Fox News is told is nearing completion. Horowitz has previously found that senior FBI officials routinely leaked information without authorization to the media, and also received "improper gifts" from reporters, including meals and sporting event tickets. Most notably, Horowitz found that FBI officials' anti-Trump communications raised doubts as to the integrity of their work. Republicans, meanwhile, are increasingly looking for answers from U.S. Attorney for Utah John Huber, who was appointed a year ago by former Attorney General Jeff Sessions to review not only surveillance abuses by the FBI and DOJ, but also authorities' handling of the probe into the Clinton Foundation. Huber, Republicans have cautioned, has apparently made little progress, and spoken to few key witnesses and whistleblowers. But in January, then-Acting Attorney General Matthew Whitaker reportedly indicated at a private meeting that Huber's work was continuing apace. 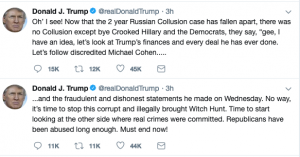 Does his statement; "...Time to start looking at the other side where real crimes were committed..." finally indicate he may have a card up his sleeve yet to play? Many have commented and some even hoped that President Trump has information, yet to be displayed, or a plan yet to be implemented to investigate the 'real crimes' committed during and after the 2016 presidential campaign.